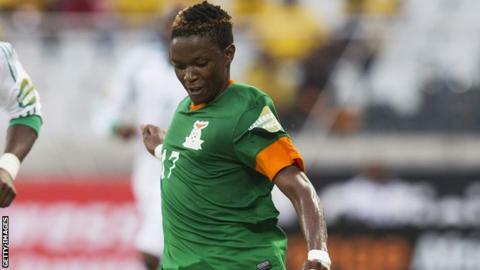 Midfielder Rainford Kalaba says his Zambia team-mates need to take inspiration from their 2012 Africa Cup of Nations triumph in Gabon, as they approach the qualifiers for Gabon 2017. Kalaba, one of the smallest players in the Zambian team, carries on his shoulders the biggest responsibility as captain of the Chipolopolo. Standing at 1.6 meters, the 28 year-old assumed the skipper's armband from towering defender Stopilla Sunzu this year, and the TP Mazembe midfielder is enjoying the added responsibility. But he knows being captain of a team that won the Nations Cup three years ago in Gabon will count for nothing if Zambia do not win the trophy again under his leadership. "The draw is not easy and there is no room for complacency," Kalaba told BBC Sport. Chipolopolo have to get through a qualifying series that pits them against Kenya, Congo and Guinea-Bissau in Group E.
"We need to be committed with our preparations to ensure a good qualifying campaign. "It's important for us to clearly draw our objectives and work towards achieving them." And it was a case of mixed emotions for Kalaba when Gabon were chosen as hosts of the 2017 tournament. To many Zambians, until 2012, Gabon evoked sad memories of the 1993 plane crash which killed Zambia's national team. They were flying to Senegal for a 1994 World Cup qualifier against the Teranga Lions. Kalaba chooses to look at the positives and revisit happy memories of Gabon from the 2012 Africa Cup triumph. "It's good that the Africa Cup will be played there because we have a lot of support in that country after winning the Africa Nations Cup there," the TP Mazembe player says. "The atmosphere in Gabon will definitely favour us if we qualify. "If we are united as a country - from the government, the Football Association of Zambia to the fans - nothing is impossible. "For me, it will actually be good to qualify for the Africa Cup because that will give us impetus for the 2018 World Cup. "We just need to stick together as a country and anything is possible." Qualifying for the competition begins in June and concludes in September 2016.